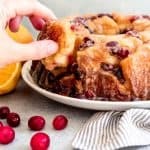 Orange zest and tart cranberries are tucked into every nook and cranny between pillowy soft rolls in this Cranberry Orange Pull-Apart Monkey Bread that will be a showstopper at any holiday gathering, whether it's for breakfast, brunch, or dessert! Cut each roll in half and set aside. Generously spray the sides and bottom of a bundt pan with cooking spray. In a medium bowl, combine the sugar and orange zest. Melt the butter in another bowl. Dip each piece of dough first in the melted butter and then in sugar zest mixture. Transfer to a large bowl. Add the coarsely chopped cranberries to the bowl of sugar coated dough and toss to combine, then transfer to the prepared bundt pan. Cover lightly with plastic wrap or a clean towel and let rise overnight until the rolls are puffy and reaching the top of the bundt pan. Preheat the oven to 375 degrees F, then bake the monkey bread for 45-50 minutes until the rolls in the center are cooked through. Cover with heavy duty aluminum foil for the last 20 minutes of baking to prevent the rolls on top from browning too much. Remove the monkey bread from the oven and immediately invert onto a large plate or serving platter. Whisk together the glaze ingredients and pour over the monkey bread while still hot, then serve for guests to pull apart while warm. Add 1/2 cup chopped pecans if you would like an extra crunch!